Stay sharp, focused and fully immersed with an advanced weapon for your PS VR arsenal. Discover a new level of intense action with the PS VR Aim controller and bring incredible precision to compatible PS VR games. Aim down your in-game sights, get a lock on your target and let the integrated motion sensors and light sphere keep your shots deadly accurate. Move through virtual worlds with twin sticks and DUALSHOCK 4 controls, built for left and right handed players, keeping you armed and ready for any firefight. 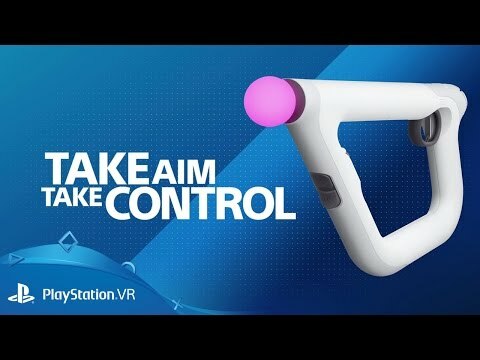 Live the game with a range of PS VR Aim controller compatible titles available now or coming soon. Pick up your PS VR Aim controller, choose from bazillions of over-the-top weapons, and shoot 'n' loot your way across the untamed world of Borderlands. Use your PS VR Aim controller as a paint gun to solve colour-based puzzles as you try to escape a series of tricky test chambers. Attack and defend tactical objectives in team-based shooter where stealth, coordination and deadly precision are essential in securing your target. Embark on a perilous journey across an extra-terrestrial world in Farpoint – created with the PS VR aim controller in mind to deliver an enhanced, immersive and action-packed survival adventure. Blast your way through the nightmarish hellscapes of legendary FPS Doom in virtual reality and lay waste to horrific demons with an arsenal of weapons – all recreated by the PS VR Aim controller. Built to connect you intuitively with virtual worlds, PlayStation Move motion controllers allow you to effortlessly interact with your virtual reality environment, mimicking real-world actions for an incredible sense of presence in compatible PS VR games.